3) promote partnerships and facilitate the integration of policies, plans, programs, and systems towards a holistic perspective, through the conduct of training, education, policy/action-oriented researches, consulting/technical assistance, and publications in good governance and productivity improvement. 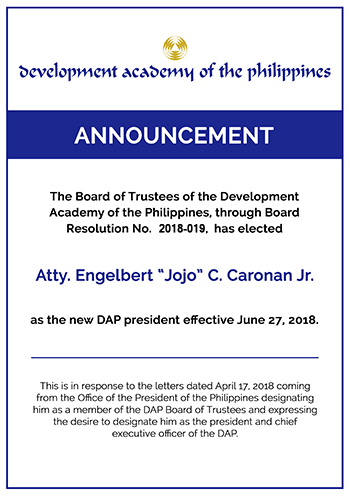 The beginnings of the Development Academy of the Philippines (DAP) started with the story of two men who got together on a rainy afternoon in Tagaytay City. It was on the February 1, 1973 when freshly retired Education Secretary Onofre D. Corpuz and then Development Bank of the Philippines (DBP) Chairman Leonides S. Virata motored to Tagaytay City after having a hearty fiesta lunch in Silang, Cavite. Chairman Virata showed Dr. Corpuz the site of the DBP training facility started by the latter’s predecessor, Gregorio S. Licaros, whose obsession was to construct buildings wherever he has been at. 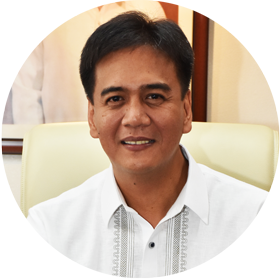 Since Chairman Virata did not want the training center to be exclusively for DBP, he asked Dr. Corpuz for ideas on how best to maximize the use of the facility. It was five months after the declaration of Martial Law. If the military had the Philippine Military Academy (PMA) as their school for their officers, maybe there ought to be a development-oriented academy for the civilian bureaucracy. There was a lot of thinking and talk about development, the need for a generation of leaders with new development perspectives, and the need for new technologies to support development programs. Dr. Corpuz suggested the creation of an institution to provide all these. The idea captured the interest of Chairman Virata and both of them agreed to work for its realization. Dr. Corpuz assembled a team of young professionals, headed by Horacio “Boy” R. Morales, who went through many lengthy discussions in his office at the Mirasol Building in front of the Philippine General Hospital where they came up with the concept, organization and programs of what later became the DAP. Chairman Virata, on the other hand, discussed the idea and convinced the heads of government financial institutions (GFIs) about the soundness of the venture. And so on May 11, 1973, DBP Chairman Leonides S. Virata, National Economic and Development Authority (NEDA) Director-General Gerardo P. Sicat, Social Security System (SSS) Administrator Gilberto Teodoro, Central Bank of the Philippines Governor Gregorio S. Licaros, Government Service Insurance System (GSIS) President and General-Manager Roman Cruz, Jr., and Philippine National Bank (PNB) President Panfilo O. Domingo signed a Memorandum of Agreement (MOA) wherein they agreed to establish the Development Academy of the Philippines (DAP) as their joint project. 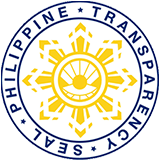 The aforementioned GFIs, which eventually became the Founding Institutions of DAP, agreed that: 1) they would participate in the governance of the DAP, as well as provide annual financial contributions for the initial operations of DAP, and create a DAP Endowment Fund; 2) DBP would complete the construction of the training center in Tagaytay and make available to the DAP the full use of the said facility (which later on was donated to DAP); 3) NEDA would make available to DAP the use of the equipment, facilities/budgetary, and other resources of its Productivity and Development Center (PDC) and transfer to DAP the functions of PDC, including its role as the implementing agency of the Asian Productivity Organization (APO) for the Philippines. With this, the proponents of the establishment of the DAP went to see the President of the Philippines who, after having seen the value of the idea, signed and issued Presidential Decree No. 205 on June 7, 1973 formally creating the DAP. Three weeks after, the President of the Philippines traveled to the newly constructed training facility in Tagaytay City on June 23, 1973, to formally inaugurate what is now the Development Academy of the Philippines.